B-59 is a powerful acidic cleaner and deoxidizer that brightens aluminium and stainless steel by chemical action. 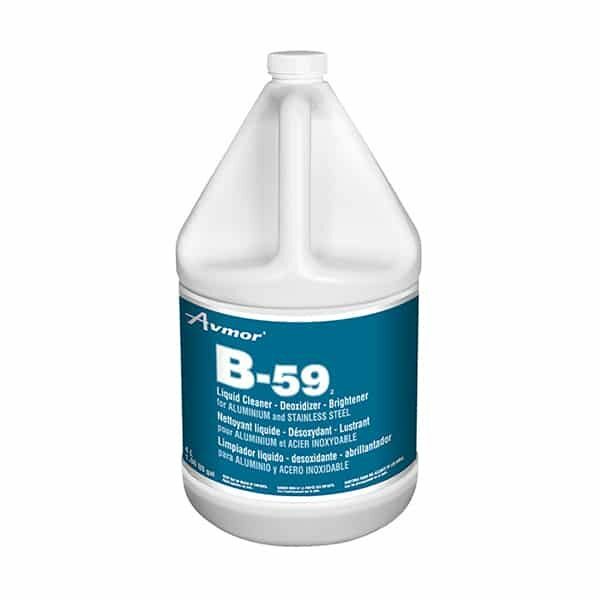 B-59 has been especially formulated to remove oxidized film, corrosion and dirt in one easy operation. Also removes aluminium oxide from aluminium plates prior to welding. Safe on ferrous and non-ferrous metals. DO NOT USE ON NEW EQUIPMENT (6 MONTHS OLD OR LESS). DO NOT SPRAY OR APPLY SOLUTION WHILE DIRECTLY EXPOSED TO SUN AND WIND. 1. Pre-wet surface to be cleaned with cold water. 2. Spray from bottom upwards in sections up to 3 meter (10 feet) wide. 3. Let solution work for 2 to 5 minutes. Flush clean with cold water. 4. Keep entire area wet with solution during clean-up. 5. To clean corroded, pitted and rusted surfaces, spray on the solution and agitate with stiff brush. FOR NORMAL CLEANING: Dilute 1 part cleaner to 10 parts water. Sponge or brush on. FOR PLATE CLEANING BEFORE WELDING: Dilute 1 part cleaner to 2 parts water. Apply with brush. Let stand for 2 minutes then wipe dry. No need to rinse. CAUTION: AVOID PROLONGED CONTACT WITH GLASS. PRECAUTIONS FOR FOOD PLANTS: For non food contact surfaces only. Avoid contamination of food during use. Do not store in food processing or food storage area.